If you haven't seen one of the newest Hawks on defense, then you haven't been to the Hawks mini-camp this week. Defensive Tackle Colin Cole is a beast, 6'1" and 330 pounds. Don't let the weight fool ya, this guy can bring it. I watched him closely at practice today and he knows how to turn on the jets for a big man. 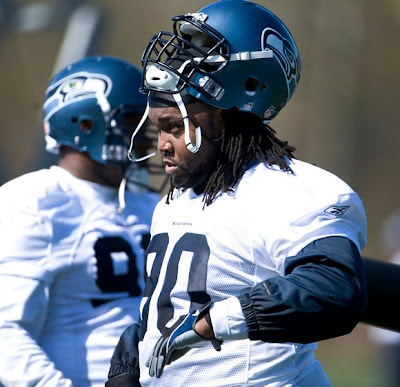 With Cole, Brandon Mebane, Cory Redding, Red Bryant and Craig Terrill all at D-tackle, I think the Hawks finally have the cupboard's full at that position. "I'm here to help wherever I can", says Cole. "I'll work hard, learn the schemes and do what I can to get this team back to the top." The former Green Bay Packer is excited to be in Seattle and I'm excited to get the chance to cover this guy.